Review Summary: A delightful, introspective and touching motion picture. And an amazing turn by Kalki! Do not pass up a sip of Margarita, With A Straw. It could be life-altering. If nothing else, it will soak you with its warmth. Attempting to talk about this to a world which largely treats disabled people as sexless beings and conveniently looks away, this is an absolutely brave move. Film will depend on exceptional word of mouth to survive as it has no great buzz or marketing awareness.Go for this one for powerful acts and impressive story! Margarita, With A Straw, for most part, is a better film. 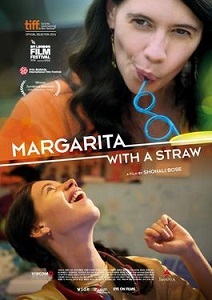 Margarita with a Straw is that rare film that reaches for the stars with its feet firmly on the ground. Honest, soaring, eye-opening and all the while entertaining, Shonali Bose's little gem of a film is well worth the price of an admission ticket this weekend. Everyone's triumphs and struggles are the same and as Laila finds her way, we stop seeing her cerebral palsy and see only her. Go book your tickets and watch it with people you love, I guarantee you won’t be disappointed. Talk of a film on the disabled or 'differently-abled', and we all know that it is one subject our industry is never comfortable with. She has a glad eye for the cute English boy on campus and loves to crack jokes. Ultimately, Margarita With A Straw is a film with a lot of heart and a powerful performance from Koechlin, but you can't help feeling that Laila deserved better. She made her up pretty as a picture! But this is not a normal film, it is a special film highlighting Special Children who are differently-abled and they deserved better.